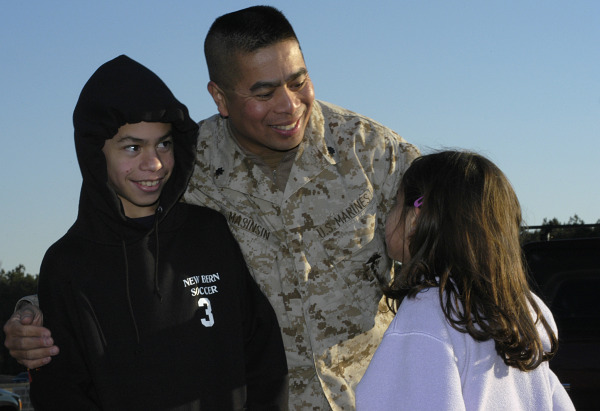 There are 1.8 million children and families of military dads are affected by the unique stress of military life, particularly during deployment. Help us support them! If you can help NFI achieve its target of $1,000 we can provide fatherhood resources to Marine Corps Base Camp Lejeune! The dads of military kids will benefit from National Fatherhood Initiative's unique educational materials for dads - to help them stay involved with their kids, and be there for them, even while deployed. Unfortunately, research shows that the kids of military dads can experience similar unfortunate outcomes as children in father-absent homes - such as doing poorly in school, emotional/social issues, maltreatment, and more. Your support means a military child gets the dad they need to be prosperous and successful. Approximately 593,000 active-duty service members and nearly 300,000 U.S. reservists are dads. 150,000 military fathers are currently deployed, with deployments ranging from 30 days to 15 months. This campaign ends today. Please consider giving today if you wish to help us support deployed dads and their families. Share NFI's campaign on your social media accounts. Invite your friends and contacts to support NFI's campaign. Thank you for understanding the importance of connecting military fathers with their families. We want all kids to have an involved, responsible and committed dad—your support helps make this happen.